Renowned NFL analysts' tips to make football more accessible, colorful, and compelling than ever before More and more football fans are watching the NFL each week, but many of them don't know exactly what they should be watching. What does the offense's formation tell you about the play that's about to be run? When a quarterback throws a pass toward the sideline and the wide receiver cuts inside, which player is to blame? Why does a defensive end look like a Hall of Famer one week and a candidate for the practice squad the next? 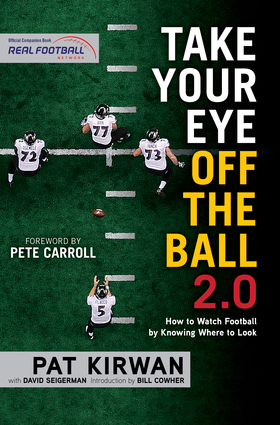 These questions and more are addressed in Take Your Eye Off the Ball 2.0, a book that takes readers deep inside the perpetual chess match between offense and defense. This book provides clear and simple explanations to the intricacies and nuances that affect the outcomes of every NFL game. This updated edition contains recent innovations from the 2015 NFL season. Pat Kirwan is one of the nation' most well-respected and popular NFL analysts. He is the cohost of Movin' the Chains on Sirius NFL Radio and a featured columnist on NFL.com and , since 2003, he has been an editorial contributor to the NFL Today on CBS and makes frequent appearances on TV and radio programs across the country. He spent 25 years working in football, coaching at the high school and college levels before joining the New York Jets' staff as a defensive assistant coach and as the director of player administration. He lives in New York City. David Seigerman is a veteran sports journalist who has worked as a field producer for CNN/SI. He is the managing editor at College Sports Television, and is the cowriter and coproducer of the documentary The Warrior Ethos: The Experience and Tradition of Boxing at West Point. He lives in Larchmont, New York. Pete Carroll is the head coach of the Seattle Seahawks. He lives in Seattle. Bill Cowher is a former NFL coach and player and is now a NFL analyst. He lives in Pittsburgh, Pennsylvania.